After long negotiations, Borussia Dortmund have finally completed the signing of Thomas Delaney for €20 million from Werder Bremen. Ultimately, Dortmund beat out several English Premier League sides in the race to sign the Danish international, who will be representing Denmark at the 2018 FIFA World Cup in Russia. Delaney had been linked with a move to England since the spring. A duel, US and Danish citizen, Delaney’s family is partly of Irish decent and he has been vocal about his desire to move to the Premier League. The likes of Brighton & Hove Albion and Tottenham Hotspurvoiced their interests. But although Delaney had his sight set on the Premier League, he also valued the Bundesliga. “The Bundesliga feels like the Champions League,” Delaney told the press shortly after arriving in January 2017 from FC København. At Werder Delaney quickly developed into a key player. The central midfielder would score four goals and one assist in 13 games for Werder and was a key component in the side being able to compete for a Europa League spot until the final day of the 2016/17 Bundesliga season. Werder, however, somewhat benefited from several of the big sides having an off year that season. While Delaney quickly established himself in the league his head coach at the time, Alexander Nouri, was a flash in the pan. Once again Werder had a slow start to the season and Werder seemed a candidate for relegation. In came Florian Kohfeldt in October 2017. Under the 35-year-old head coach Werder quickly stabilised and rose up the table– but unlike last year never challenged for Europe. Nonetheless, Kohfeldt played attractive football and Thomas Delaney was a key component of the way Bremen played. Scoring three goals and five assists in 32 games the Danish midfielder patrolled the midfield while at the same time being dangerous in front of the opponent’s goal. Delaney, is not necessarily, a midfielder to set a cracking tackle – here Dortmund might make an additional signing. But he will bring order to a midfield that at times looked to be in disarray this season. His strengths of adding pace to the midfield, playing deadly set-pieces and an ability to shoot from distance are some of the attributes that stand out. Delaney was also one of the best players when it came to creating chances in the league – he was ranked seventh in expected goal contribution last season. Focusing on his defensive attributes in the press conference suggests that Delaney was first and foremost signed for his defensive abilities rather than his attacking prowess. Therefore, the midfielder will likely fit in a more defensive role in the tactical setup that Lucien Favre wants to install at the club. 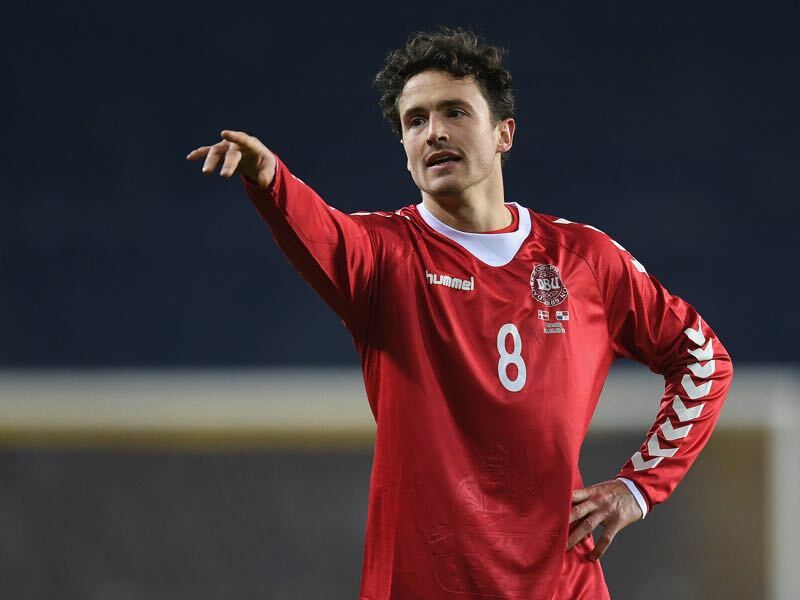 Could Favre re-invent Thomas Delaney? Delaney’s attacking attributes, such as shooting from distance, in fact, could become obsolete under the Swiss head coach. Favre is a big believer of having his teams looking for the ideal scoring situations. Hence, shots from distance, which have a low expected goal scoring rate, are being frowned upon by Favre. It will, therefore, be interesting to see what Favre will do with Danish 182cm tall midfielder. Delaney has literally played every position in midfield, and even in backline, since becoming a professional player for FC København in 2008. Given that Delaney was one of the best pressing players and with 2.5 tackles per game Delaney led Werder in that category. Furthermore, Delaney also bossed Werder’s airspace winning 3.7 aerial duels per gamefor Werder this season – leading the club in that category as well. Looking at those stats, and, the fact, that Werder have sold Sokratis to Arsenal, Delaney could even be a candidate for a job in the backline. Favre would be no stranger of converting players to different positions and Delaney’s ability to open the game with his passing ability would provide Dortmund with a player that they did not possess since Mats Hummels left for Bayern. It would explain why Dortmund have been linked with Sampdoria’s Uruguayan defensive midfield destroyer Lucas Torreira. With Torreira and Delaney, as well as Julian Weigl and Mahmoud Dahoud there seems to be a surplus in midfield – especially when one includes Sebastian Rode and Gonzalo Castro. Moving Delaney to defence, therefore, could make sense. But ultimately Favre’s tactical mind works in riddles and it will be fascinating to see what he will do with the latest Dane to patrol Dortmund’s SIGNAL IDUNA Park.